On Friday, April 30th, the FDIC reported 7 additional bank closings including three banks in Puerto Rico. It’s ironic that Congress passed a bill asking Puerto Rico if it wants statehood on the same day. This brings the total number of bank failures under Obama to 204. The total number of bank failures in April was 23, and the year-to-date figure is 64. You can thank left-wing Progressives like Obama, Pelosi, Reid, and some on the right for the continued destruction and consolidation which is happening in the banking sector. I am now projecting that 195 banks will fail this year. Meanwhile, approximately $370 billion of the $700 billion TARP fund sits on the sidelines, while troubled assets remain on many bank’s balance sheets dragging them under. Wasn’t that money supposed to be used to get rid of toxic assets? Well, if Progressives are going to sit idly by and watch banks fail, then they need to give us back our $370 billion. The other $330 billion appears to be a total loss. Obama and his Progressive entourage should claim it, cut their (our) losses, and prepare for defeat at the polls. Remember that these are the same Progressives who hate banks and corporations and who will stop at nothing in their efforts to destroy our free enterprise system and turn America into a state run socialist utopia. They must be defeated. Below is a list of the 23 banks that failed in April of 2010. 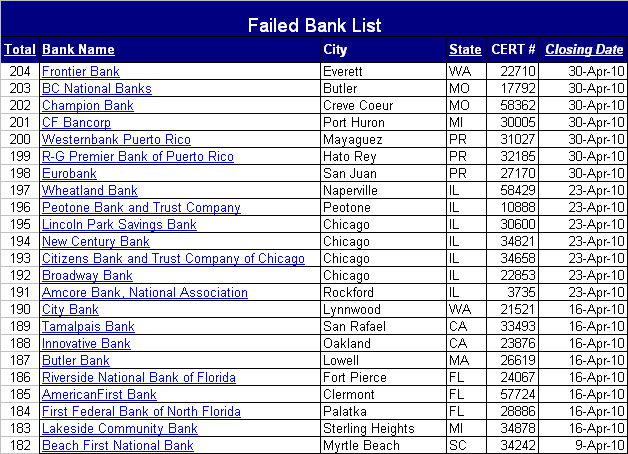 Below is a comprehensive listing of the 204 banks that have failed since Obama took the reigns. 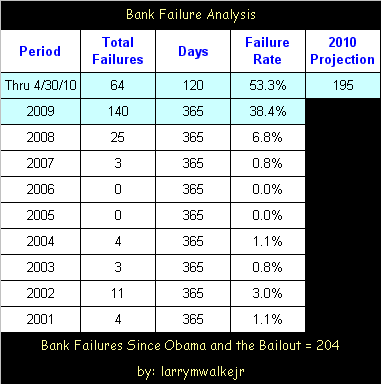 There were 25 bank failures in 2008, and 3 in 2007 making the total for the present crisis 232. In contrast, during the S&L Crisis of the 1980’s and 1990’s there were 747 S&L failures at a total cost of $160.1 billion.